The Backboard: How Do Isner, Mónaco, Almagro and Rhyne Williams Use Video And Stats? In this week’s edition of The Backboard, I ask the Houston ATP 250 semifinalists (Isner, Almagro, Mónaco & Williams) about their use of statistics and video; plus much more. 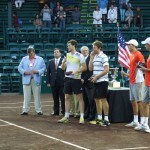 A post full of information, analysis, photos and quotes from the semifinal action, as well as the doubles final, at the 2013 Men’s Clay Court Championship, featuring: Nicolás Almagro, Rhyne Williams, Juan Mónaco, John Isner, Bob and Mike Bryan, Jamie Murray and John Peers.